Writing covered calls is an extremely powerful investment tool that few people take advantage of. Imagine earning an extra 8 – 12% per year by simply holding onto a stock that you already own. The only requirements are that you own at least 100 shares and you must have the ability to trade options in your brokerage account. 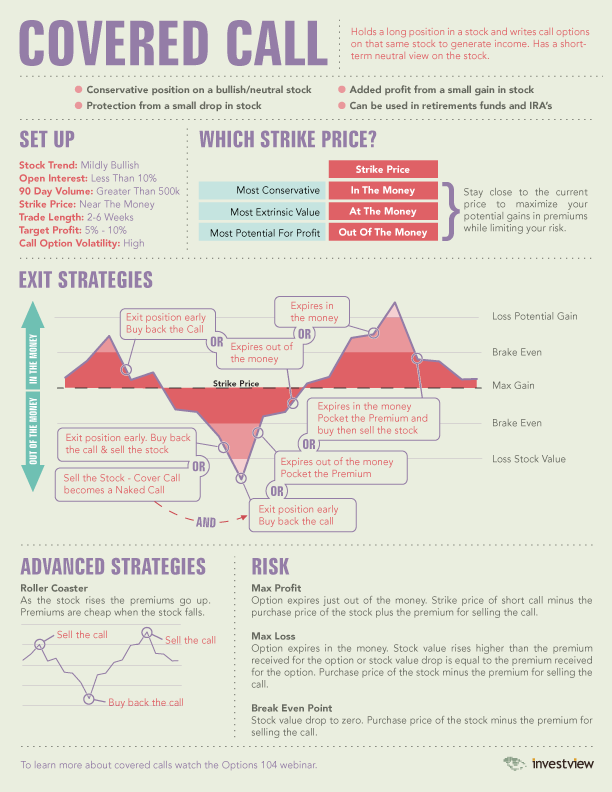 Today’s covered call option infographic does a fantastic job at emphasizing the key fundamentals and rewards of covered calls. Normally, I focus on 25 – 50% of an infographic’s content, but I feel that this entire infographic is worthy of discussion. Get more Options insight for Advanced and Novice Traders. Right at the top, we’re presented with the situation in which a covered call would be an appropriate investment. An investor who holds a position in a stock would sell covered call options on that same stock to generate income. You have a short-term, neutral view on the stock. Being a conservative position, you want to the stock to increase in value slightly, but not too much. If the stock rises, you profit from the covered call premium and gain up to the strike price. On the other hand, if the stock happens to drop slightly, your losses will be offset by the premium received for the selling the call. Open interest less than 10%. Open interest is the amount of contracts that are currently outstanding. This consists of sold or purchased contracts. 90 day volume greater than 500k. Covered calls should not be sold on stocks with low volume for a number of reasons. The option volume will likewise be low and this will create a large spread (difference between the bid and ask). Wide spreads make it more difficult to profit from the trade. Strike price near the money. Selling calls with strikes out of the money result in smaller premiums and calls deep in-the-money cap your stock gains at low strike prices. Target length: 2 – 6 weeks. Time decay begins to affect options at a higher rate around 6 weeks. By selling calls with greater than 6 weeks of time left until expiration, the decay occurs at a more gradual rate, which you do not want. High volatility equals higher prices and that’s a good thing when you’re selling and receiving the premium. If you’ve sold a call, you must know how to exit the position. This section is better explained by the infographic chart. Covered calls are perfect for dividend paying stocks. The stock price is adjusted downwards every time a dividend is paid, so the call is pushed further away from the strike price. Your goal is to have your options expire out of the money so the stock does not get called away and you continue to collect the quarterly dividend. The dividend combined with your call premium can result in a great, annual yield. Learn even more about Selling Covered Calls To Generate Extra Income. No investment strategy is complete without a risk analysis. This step is even more important when dealing with options. Covered calls are considered very conservative, but more complex option strategies carry heightened risks. Always calculate your max loss and max gain to put the whole strategy into perspective.